Féroé (Iles) - 2007 - No 605/607 - Oiseaux. For those who are not (used or new with hinges), the condition is indicated in the title. Féroé (Iles) - 2005 - No 526/529 - Oiseaux. For those who are not (used or new with hinges), the condition is indicated in the title. Féroé (Iles) - 1991 - No 213/214 - Oiseaux. For those who are not (used or new with hinges), the condition is indicated in the title. Scott # 288a. Year of Issue 1995. Quality Mint Never Hinged/MNH. Topic Birds. Country/Region of Manufacture Faroe Islands. 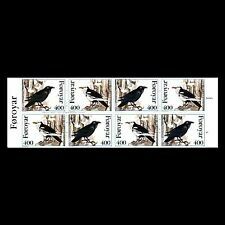 (Faroe Islands 2009 Rock Pigeon - Mint Never Hinged (MNH). Set of 2 values (2v Set): 14Kr, 36Kr. You will be back for more! 3) Select each item and 'Add to Basket'. Set of 2 values (2v Set): 18Kr, 27Kr. You will be back for more! Féroé (îles) 2002 Mi. 427-430 Neuf 100% Oeufs et poussins d'oiseaux. Ils se déplacent à vos risques et périls. -20% de qualité: lot avec un ou plusieurs défauts. Tauben einwandfrei postfrisch. Doves mint never hinged. Birds Showing chicks and eggs, Whimbrel, Common Snipe, Oystercatcher, Golden Plover. -:- The item you receive may not be the item scanned, but will be of similar quality. You think price is not right?. Stanley Gibbons No. : MS1184. -:- The item you receive may not be the item scanned, but will be of similar quality. Condition: Mint Never Hinged. No Exclusions. 6,00 EUR prix catalogue, selon Michel N-Europa 14/15. (Faroe Islands 2018 Seabird Fowling - Mint Never Hinged (MNH). Set of 2 values (2v Set): 10Kr, 44Kr. You will be back for more! 3) Select each item and 'Add to Basket'. Set of 2 values (2v Set): 10Kr, 44Kr. You will be back for more! Stanley Gibbons No. : 442. No Exclusions. You think price is not right?. Féroé (îles) 2005 Mi. 530-533 Neuf 100% Oiseaux. Färöer, Vögel MiNr. 28 - 30, 1977 MNH (FAII014). Ausgabeanlass: 2010 Natur. Ausgabejahr: 2010. litiges en ligne Cela revient bien sûr plus cher qu´une lettre normale, mais évite bien des soucis inutiles pour chacun. Expédition enFrance Elles sont indiquées en bas de page avec d´autres informations légales. Färöer, Seevögel MiNr. 36 - 38, 1978 MNH (FAII017). Féroé (îles) 1999 Mi. 348-365 Neuf 100% Art, bateaux, Nature, oiseaux, table. Féroé (îles) 1999 Neuf 100% Oiseaux, nature, Noël. Birds Showing chicks and eggs, Whimbrel, Common Snipe, Oystercatcher, Golden Plover. You think price is not right?. No Exclusions. Date of issue: 17 June 2002.
:- The item you receive may not be the item scanned, but will be of similar quality. You think price is not right?. No Exclusions. Date of issue: 13 June 2005. Yvert No. : 526-529. 3,00 EUR prix catalogue, selon Michel N-Europa 12/13. Stanley Gibbons No. : 292. -:- The item you receive may not be the item scanned, but will be of similar quality. Year of issue: 1935. No Exclusions. Condition: Cancelled. 5,00 EUR prix catalogue, selon Michel N-Europa 12/13. 16,00 EUR prix catalogue, selon Michel N-Europa 16/17.